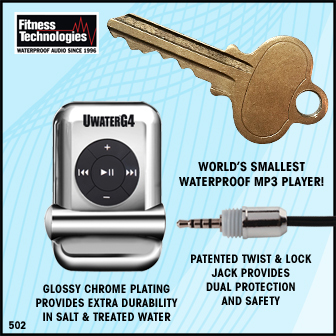 "waterproof mp3 player by Fitness Technologies"
"World’s Smallest Waterproof MP3 Player"
Twist & Lock Jack provides double protection. Selected by USA TODAY – "Six Great Gadgets To Buy For Your Workout"
Chosen by US News & World Report - "Best Travel gadgets under $100"
Featured on CBS TV – "Best Gifts For Dads & Grads"
This 4 GB Chrome-plated micro-sized MP3 Player (the smallest you have ever seen) clips onto goggles or fastens onto headband, armband, or belt for swim-anywhere, go-anywhere, sweat- anywhere listening pleasure. End forever the boredom of lap swimming or just enjoy the novelty of hearing music and audio books in the water, on the beach, while surfing, scuba diving, skiing, sailing, exercising, showering, outdoor walking, running, any activity! 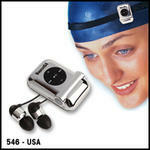 The UwaterG4X Chrome audio is tuned to cut through the noise of splashing water and deliver ultra clear stereo sound. Our Twist & Lock matching chrome-plated earphones completely block water out plus provides crucial long term protection against corrosion, a problem which tends to damage regular devices. Extra-soft silicon ear-tips (4 sets) seal water out and keep pure stereo sound in. 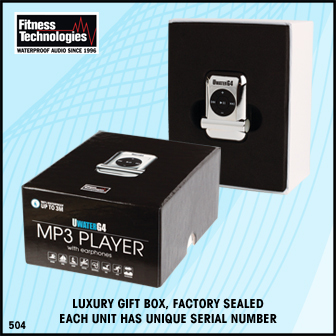 And the special Chrome plating (player & earphones) makes this product super durable in salt and treated water, as well as resist sweat. Since 1996 our Waterproof Audio Technologies (WAT) were featured in the New York Times, LA Times, Men's Health (Europe), Swim World, Fitness Swimmer, Triathlete Magazine, CNET, as well as over 30 other publications. Also endorsed by the US National Sporting Goods Association. -- Twist & Lock Jack. -- Glossy Chrome Plating for extended durability. I really like that UwaterG4X Chrome Player comes with many features. When i purchased it I checked their user manual and everything was clearly explained and its easy to use. Now i dont need to hear the sound of splashing water.it provides clear sound. I love to use it. G4X Chrome is small and comfortable to use. I like it as it clips onto goggles.It makes listening music a pleasant experience. Hey, the product is superb. It is great value for money. It is definitely great to use and makes swimming so much fun.